A princely residence dating from the 12th, 15th and 16th century which was once the home of Jean de Dunois, the owner of the Château in the 15th century and a companion-in-arms of Joan of Arc. 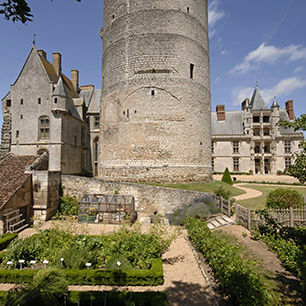 Standing some 60 metres above the Loir Valley, the Chateau features a rare succession of medieval, Gothic and Rnaissance architectural elements including two open staircases overlooking the courtyard. The beautifully preserved interior houses a fine collection of tapestries. The Gothic Sainte-Chapelle, built by Dunois, contains some outstanding sculped statues. A medieval kitchen garden has recently been laid out at the foot of the main keep to illustrate how herbs and spices were used in the cuisine and medicines of the Middle-Ages. 2 p.m. to 6.15 p.m.
2 p.m. to 5.30 p.m.
From Mans: A 11 to D 955 direction Châteaudun. From Chartres: N 10 to Châteaudun. From Orléans: D 955 to Châteaudun. From Tours: N 10 to Châteaudun.